A car engine’s operating temperature ranges between 90.5 to 104.4 degrees Celsius because of the high-rate of combustion inside the engine which results in a lot of energy being dissipated in the form of heat energy. This heat energy needs to be released efficiently in order to keep your engine’s temperature within its working range. If the temperature reaches critical levels it will result in the destruction of the engine. Therefore, to maintain temperature, radiators are used in cars to dissipate heat. 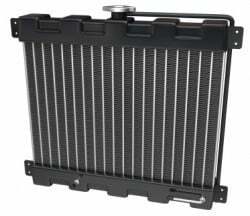 Basically, the radiator is a type of heat exchanger, which uses coolant such as water to absorb heat from the engine. The coolant runs to and from the engine, thus it heats up as well. This is where a cooling fan, placed just beside your car’s radiator, comes in handy. When the coolant absorbs heat, its temperature rises, but the fan that is placed near it blows air to cool it off. Blowing air cools down coolant to a good extent using convection phenomenon. This continuous cycle of absorbing heat through radiation and getting it released through convection by fan helps maintain car’s engine temperature. Modern radiators are made up of Plastic Aluminum. And even though, the heat transfer rate of aluminium is lesser than that of brass, an increased size helps in faster cooling. They are made by brazing thin tubes of aluminium fins and flattened aluminium tubes. For instance, where 2 rows of copper/brass radiators are used, 1 row of aluminium tube will do the same amount of work. Thermostats are also placed at the front of the engine to detect when the engine’s temperature goes beyond the limit. Once the temperature rises, water and coolant is released from the radiator which absorbs the heat produced due to engine’s friction and burned fuel. The surface area of the radiator is kept large enough to let the fluid cool down. Besides placing fan, air from surrounding is brought in through vents that further keeps the engine cool. Coolant, that is usually water, but preferably should be a mixture of antifreeze and water, circulates around engine through a pump and is cooled down through the radiator. This antifreeze helps to keep water from freezing in cold environments and also prevent it from boiling in very hot environments. Low level of coolant is one of the common and basic reasons of overheating. Low level of coolant means less amount of fluid goes into the motor, which eventually results in less heat absorption from engine and dissipation respectively. Generally, fluids levels don’t get low, but due to issues like gasket leaks or pipeline or radiator leakages, fluid levels lower down resulting in overheating issues. Certainly, if you see some leaked coolant beneath your parked car it is recommended to get the radiator checked as this problem can turn into a big one. Low level of coolant will result in your engine is overheating. Also, a blocked radiator can cause your engine to overheat. When you are experiencing overheating, make sure that you are checking the radiator. For more information about overheating check our article: Overheating. Sometimes radiators get choked from dirt and debris restricting the flow of the coolant. Major causes of radiator blocks are dirt, dead insects and particles of debris. This clogging is visible and can be seen from your engine bay. In case there is nothing visible, it means your radiator is choked from inside and this can be detected through the infrared thermostat. Formerly, radiators were made up of materials like copper and brass, but aluminium was selected for their manufacturing to make them lighter in weight and cost-effective. Other than just cost and weight, aluminium is known to be much better at cooling than copper and brass. So it is preferred that you have an aluminium radiator installed in your car if you don’t already have one, as the older brass material can be ineffective in controlling temperature. A malfunctioning radiator cap results in the overflowing of coolant from the radiator. Radiator cap’s malfunctioning is also one of the most common, and at times, an ignored aspect of the radiator. In case your radiator cap is not properly tightened, the coolant could spill from the radiator and cause a rise in engine temperatures. Here thermostat is not just to trigger on and off any compressor like device, but they act as a valve that releases and stops the flow of fluid in the engine to absorb heat depending on engine’s temperature. When thermostat gets malfunctioned, it stuck closed and the water in the engine gets no space to flow back hence resulting in overheating of the engine. This is the most common issue among all that is generally experienced. Sometimes the whole radiator is in good condition but the fan associated with radiator stops working. This could be due to any electrical disconnection or fan’s motor issue. Fans malfunctioning can result in improper cooling of fluid. Depending on condition, the fan can be repaired and replaced too if found necessary. The core is the biggest and primary part of the radiator. It is made up of large metal blocks with small metal fins. Heat is ventilated from coolant to the surrounding through this block area. Variety of cores are available in radiators like one, two or three core. It is preferable to change radiator if this part is damaged. Due to a change in temperature coolant system experiences high pressure. A cap placed on the radiator helps create this pressure through spring that is attached to it. It is very important that the radiator cap should not be removed when the coolant’s temperature is high as it can result in serious burns. In case your radiator cap is lost or is not working properly, you can just get a new radiator cap instead of replacing the whole radiator. Radiators also have outlet and inlet tanks. These tanks aid radiators in moving coolant hot areas of engines to a radiator. Leakage, if it occurs, can be repaired or if the necessary whole tank can be replaced separately. Generally, radiator replacement will cost you $350-$400 including labour. Can you use only Water without any Coolant in the Radiator? Can You Mix Different Anti-Freeze with Each Other?